Buckle up and turn on the tunes. It’s time for your road trip on the Yellowhead Highway. Sprawling ranch land hugs the banks of the North Thompson River in the shadow of the rounded slopes of the Monashee Mountains. The mountains encroach on the highway, snuggling up to the shoulders of the road, then splaying out again. As you travel north, a winding river comes in and out of view. Sometimes it’s on your left, other times on your right. Watch the peaks of the mountains morph from gentle mounds covered in ancient timber to jagged peaks capped by glaciers as you travel north. Know that each exit off the highway will connect you to recreational wilderness. 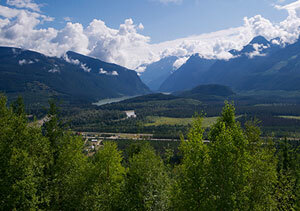 No matter what you choose to drive, the Yellowhead (BC Highway 5) calls to you to come explore. Get ready for a spin with wilderness just a step away. Grip the wheel and steer yourself along its winding course. Take as much or as little time that you need. Just remember to stay within those speed limits! Turn by turn, mile by mile, get off the grid and find yourself revelling in the freedom of the open road. The Yellowhead is the connecting artery between Vancouver, BC and the Canadian Rockies. This highway takes you to well-known destinations and is your corridor for easily accessed grand adventures. 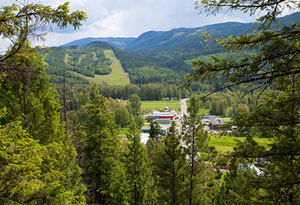 You’ll find stunning panoramic views into the wilds of British Columbia. Park your car and get off the asphalt. The Yellowhead is the gateway to varied and amazing recreational highlights. Come and hike, raft, ski and relax here. You may even come face-to-face with wildlife. No matter which exit you take, or which turn you make, an adventure is waiting just off the blacktop. The badlands push out of the South Thompson River from Kamloops and steer you towards Sun Peaks. 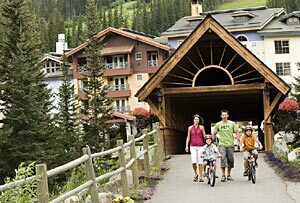 With 4,200 acres of skiable territory and three mountains to choose from, Sun Peaks boasts outdoor adventures for every type of traveller. Canada’s second largest ski resort shows off with much sought-after Okanagan powder in the winter. Come and ski-in, ski-out or to unwind in the alpine. In the warmer months, come back and visit. Hike through the when the alpine blossoms and take in our summer concerts featuring legendary headliners. This bountiful landscape is cowboy country and they have the recreation to prove it. At Jandana Ranch, you can spend your days learning to communicate with horses. 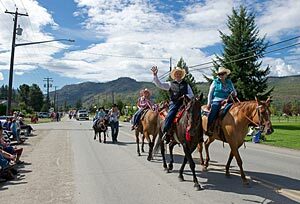 Cowboy up during the Labour Day long weekend for the annual North Thompson Fall Fair and Rodeo. The rural community of Barriere is in a low, wide valley. Vast, green ranches dot the landscape. Stop and listen: it’s here where cattle lo and horses whinny with the silhouette of the Monashees’ as a backdrop. Burnt and blackened lodgepole pines stand silent as spots of green peek through. Bear witness to the regeneration of our forest from the great fire of 2003. Before you leave Barriere stop off at the McLure Wildfire monument for a self-guided interpretive tour. The monument is for those who helped battle the great blaze and rebuild this resilient, small-town community. As you move north, past Clearwater, rounded, smooth mountains encroach on the highway. Clearwater is the gateway to Wells Gray Provincial Park. It is home to more waterfalls and wilderness than most people can ever imagine. 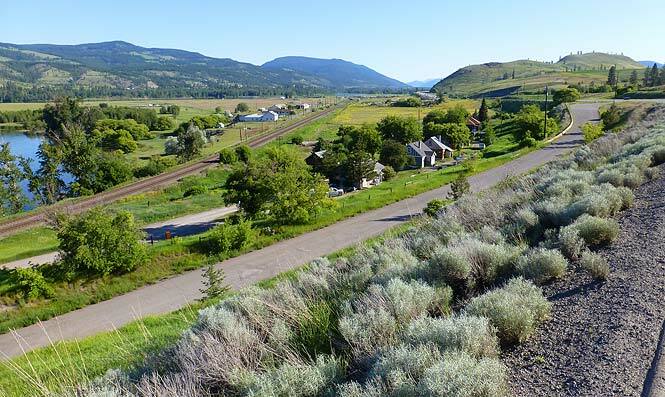 Turn off the Yellowhead to access the Park, some 35 kilometres (22 miles) along the Clearwater Valley Road. Dense forests come into view. The trees are thick and robust because their proximity to the ancient inland rainforest of this region. The accessible walking trails from the main roads will lead you into a mystical rainforest where you can hike the Rim Trail to famous Helmcken Falls. There are also several other waterfalls here for you to enjoy. You may also choose to venture along the rustic Trophy Mountains. It’s a feast for your eyes as the wildflowers paint the inclines. Those bound for water-filled expeditions can raft the legendary Clearwater River and perhaps then set your canoe into the soothing waters of Murtle Lake. Keep on that northern run, towards Blue River, where the mountains become less curved as sharper peaks begin to appear. These are the jagged slopes of the Cariboo range. It’s here where you’ll find some of the world’s best heli-skiing. Home of Mike Wiegele’s Heli-skiing in winter, it’s your gateway to pure get-away-from-it-all come summer, kayaking or canoeing the golden shores of Murtle Lake, the largest paddle-only lake in North America. If you prefer to be have a guide in the wilds, cross over to the wild side with a River Safari tour. Search the banks of the Mud River Delta for bears and beavers. You can also venture out in a 4×4 Jeep Safari, rolling through bear habitat and postcard-worthy scenery the whole way. The village of Valemount is a cozy community nestled in the ruggedly wild landscape of the Cariboo, Monashee and the Rocky mountain ranges — including the Canadian Rockies’ tallest peak Mount Robson. 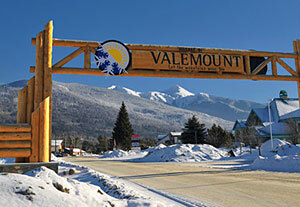 Valemount is close at hand to the mouth of the Fraser River’s headwaters, and the gateway to Jasper National Park. Plucky hikers will have found their passion, hiking the famed Berg Lake Trail, where the 22 km (14 mi) hike in leads you to the turquoise blue waters of Berg Lake. Don’t have time to hike both ways? Ride a helicopter to the lake and then hike back down. For an easier journey, amble through the bird sanctuary of Cranberry Marsh, where un-groomed trails lead you to observation towers, allowing you a panoramic view of the wetland.